NOTE: Please visit PH meter(SKU: SEN0161) to use its newest wiki. 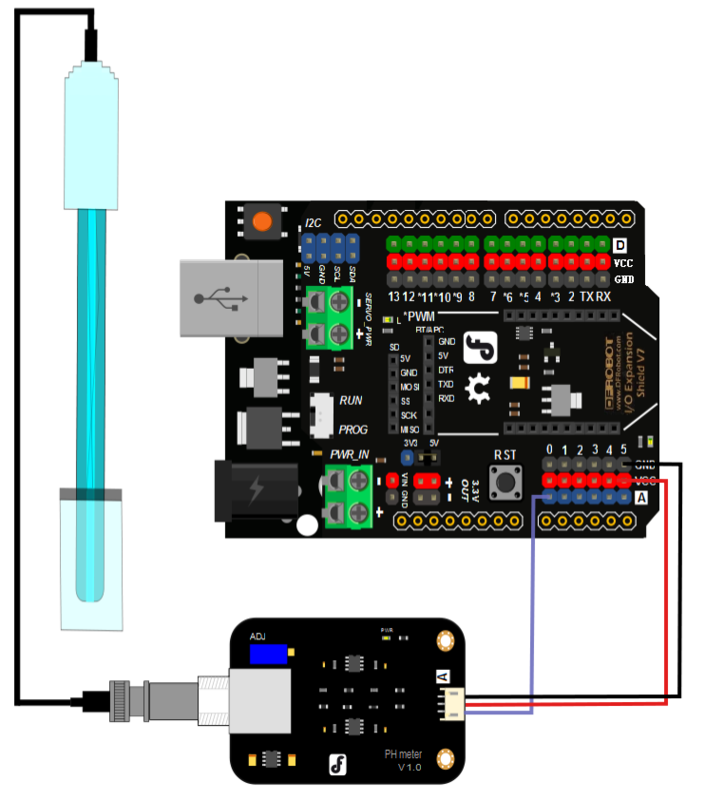 Here comes an analog pH meter Pro,specially designed for Arduino controllers. It use an industry electrode and has built-in simple, convenient, practical connection and long life, very suitable for online monitoring. It has an LED which works as the Power Indicator, a BNC connector and PH2.0 sensor interface. To use it, just connect the pH sensor with BND connector, then plug the PH2.0 interface into the analog input port of any Arduino controller. If programmed, you will get the pH value easily. This industry pH combination electrode is made of sensitive glass membrane with low impedance. It can be used in a variety of PH measurements with fast response, good thermal stability. It has the good reproducibility, difficult to hydrolysis, and basically eliminate the alkali error. In 0 to 14pH range, the output voltage of the electrode is linear. The reference system which consist of the Ag/AgCl gel electrolyte salt bridge has a stable half-cell potential and excellent anti-pollution performance. The ring PTFE membrane is not easy to be clogged, so the electrode is suitable for long-term online detection. This pH meter pro is very suitable for long-term monitoring. Attention: In order to ensure the accuracy of the pH probe, you need to use the standard solution to calibrate it regularly. Generally, the period is about half a year. If you meaure the dirty aqueous solution, you need to increase the frequency of calibration. Connect equipments according to the graphic,that is,the pH electrode is connected to the BNC connector on the pH meter board，and then use the connection lines,the pH meter board is connected to the ananlong port 0 of the Arduino controller. When the Arduino controller gets power,you will see the blue LED on board is on. Put the pH electrode into the standard solution whose pH value is 7.00，or directly shorted the input of the BNC connector.Open the serial monitor of the Arduino IDE,you can see the pH value printed on it,and the error does not exceed 0.3. Record the pH value printed,then compared with 7.00, and the difference should be changed into the "Offset" in the sample code. For example,the pH value printed is 6.88,so the difference is 0.12.You should change the "# define Offset 0.00" into "# define Offset 0.12" in your program. Put the pH electrode into the pH standard solution whose value is 4.00.Then wait about one minute,adjust the gain potential device, let the value stabilise at around 4.00.At this time,the acidic calibration has been completed and you can measure the pH value of an acidic solution. Note:If you want to measure the pH value of other solution,you must wash the pH electrode first! According to the linear characteristics of pH electrode itself, after the above calibration,you can directly measure the pH value of the alkaline solution, but if you want to get better accuracy, you can recalibrate it. Alkaline calibration use the standard solution whose pH value is 9.18.Also adjust the gain potential device, let the value stabilise at around 9.18. After this calibration, you can measure the pH value of the alkaline solution. # This sample code is used to test the pH meter Pro V1.0. Electrode when in use, the ceramic sand core and liquid outlet rubber ring should be removed, in order to make salt bridge solution to maintain a certain velocity.